May 29, 2018; Cleveland, OH, USA; Cleveland Indians left fielder Michael Brantley (23) celebrates his solo home run with third base coach Mike Sarbaugh (16) in the third inning against the Chicago White Sox at Progressive Field. The Cleveland Indians posted a tribute video to Michael Brantley, who signed a two-year deal with the Houston Astros after spending 10 years in Cleveland. 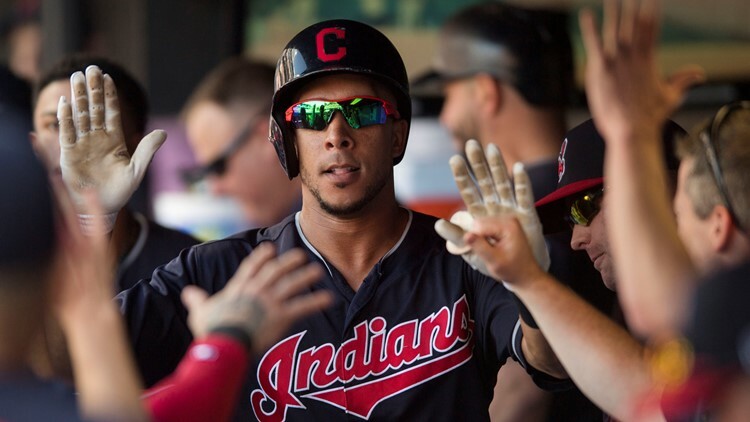 CLEVELAND — The Cleveland Indians were grateful to have outfielder Michael Brantley represent the organization for 10 seasons, and they let that be known in a social-media post Wednesday. The Indians lost Brantley, their starting left fielder, when he signed a two-year deal with the Houston Astros, but before getting back to the business of reshaping the roster, the organization posted a “thank you” video to their Twitter account. 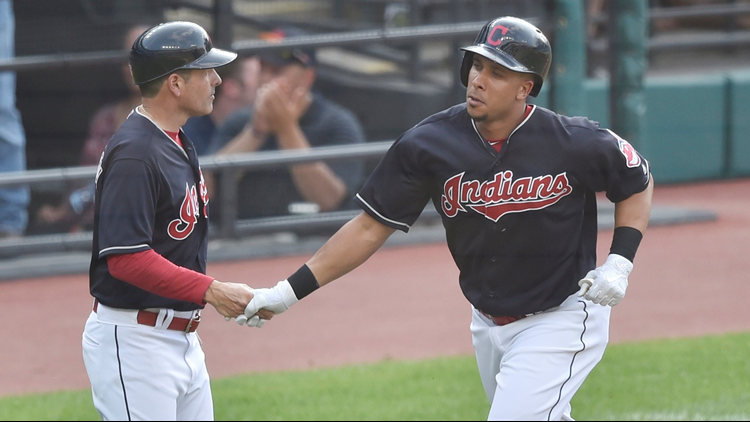 “Since 2009, Michael Brantley has made hitting Major League pitching look oh, so smooth. Thanks for everything, Doc,” the Indians posted. Healthy for the first time in three years after dealing with shoulder and ankle issues in 2016 and 2017, Brantley had an All-Star season in 2018. 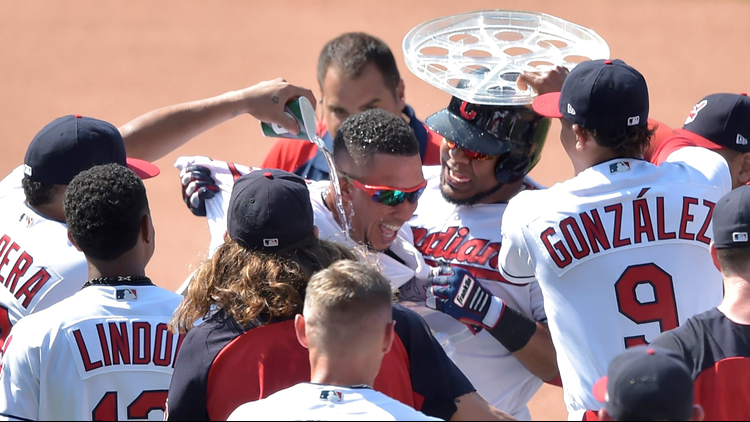 Brantley had a team-leading .309 batting average in 570 at-bats over 143 games played after the Indians exercised his option for the 2018 season. Of his 176 hits, he had 36 doubles, two triples and 17 home runs along with 76 RBI and 58 walks against 60 strikeouts. A three-time American League All-Star in his career with the Indians, Brantley underwent surgery on his right ankle in the days following the team’s elimination from the 2017 Major League Baseball Playoffs, but found his way back to the field and remained there for the entire season, something he had not done since 2015. Over the 2016 and 2017 seasons, Brantley missed 223 out of a possible 324 games. In 1,051 games over his 10 years with the Indians, Brantley collected 1,195 hits in 4,055 at-bats (.295 batting average) with 248 doubles, 19 triples, 87 home runs, 528 runs batted in, 543 runs scored and 351 walks drawn against 479 strikeouts. In addition to the .295 batting average, Brantley had career .351 on-base, .430 slugging and .781 on-base-plus-slugging percentages. Also, Brantley stole 118 bases in 148 attempts. Brantley’s best season came in 2014, when he finished third in the voting for the American League Most Valuable Player Award. Brantley, who was the “player to be named” in the Indians’ 2008 mid-season trade of then front-of-the-rotation pitcher CC Sabathia to the Milwaukee Brewers, was the club leader and set career highs in most offensive categories in 2014. Brantley was the first player in the 114-year history of the Indians’ franchise, and ninth player in MLB annals, to have 200 hits, and at least 45 doubles, 20 home runs and 20 steals in the same season. Brantley was the ninth member of the Indians’ 20-home run, 20-steals club, and the first Cleveland player since 1996 to reach the 200-hit plateau. In 2014, Brantley finished second in the American League in hits (200), third in batting average (.327) and doubles (45), fourth in on-base percentage (.385), tied for sixth in runs scored (94), seventh in on-base plus slugging percentage (.890), 11th in steals (23) and 12th in runs batted in (97).